Back in 2006, boxes upon boxes of photographic negatives form the Western Morning News ended up at the feet of Chris Robinson, one of the directors of The Plymouth Barbican Association. In celebration of the 50th anniversary of the association in 2007, whose main remit has been to preserve and manage the many historic properties in Plymouth, the association decided to create a sustainable means by which the public could access the collection offering one of their properties in Looe Street as a basis for the archive. Thanks to HLF funding in April 2007 which was secured by the then acting Archive Manager Anna Keast and Volunteer Archive Assistant Ros Dow the project was given the go ahead. One of the first things the association did was to appoint a full time Archivist to start the mammoth task of sorting through the collection ready for cataloguing and to inform the development of the necessary environment for it’s long-term preservation – that’s where I come in. One of my challenges was to work towards the creation of a public access service, so I set about bringing in the equipment, software and materials necessary for us to catalogue, scan and preserve the collection. The official opening of our onsite search room took place in February and was enormously successful, attended by directors of the association, local heritage providers and the Lord Mayor, since opening our doors to the public we have received over 100 visitors which for a small archive is fantastic! The database itself, which we hope to have online at some point, is a working success, I remember a young man who appealed to the Image Bank for an image of his late grandfather who had won a flower festival in the Guildhall in 1985, the original copy he had was sadly destroyed in a house fire some years previous. While this part of the collection has yet to be formerly catalogued, using the index we’ve produced of the whole collection, and with the information he provided, we were able to reunite him with this image and with his grandfather’s achievement. We have around 2 million post-war photographic negatives in the collection ranging from 1945 right through to 2002 covering everything in Plymouth, Devon and Cornwall depicting lifestyle and leisure events, festivals, weddings, birthdays, retirements, opening of theatres, architectural features, community events, sporting events, all sorts. 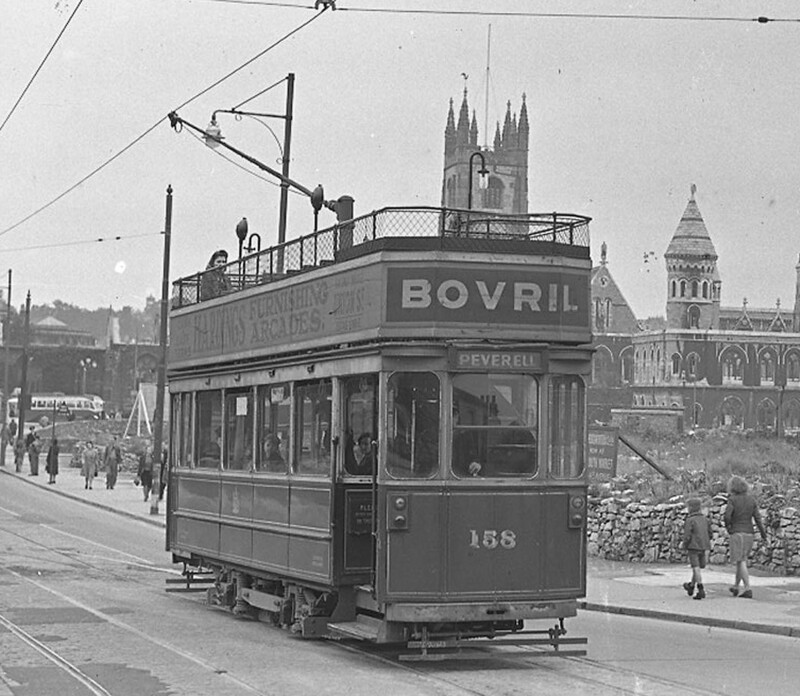 The earliest photograph we have is a stunning shot of the last tram to run in Plymouth , in September 1945, with St Andrews Church in the background (minus its roof), Mumford’s and the Corn Exchange. A typical day for me would involve handling enquiries, receiving visitors to the public access room supervising the cataloguing and scanning work, preparing material for exhibitions, talks and presentations, monitoring archival storage conditions, administering the catalogue database and the continued appraisal and arrangement of new and existing deposits. Phew! There’s a lot to do. This is where my band of ever-growing volunteers helps enormously; I don’t know where I would be without them. They have helped create the accessible catalogue of images to view; they have a range of backgrounds and interests from being keen photographers, belonging to local history societies and groups or just interested in local history, what unites them is that they’re all dedicated to the project. Most of the volunteers are local to the area which does help enormously and all of them are a wonderful asset to the Image Bank, contributing extensively to the creation of the collection database and using their own knowledge and experience. It is very much a work in progress, given the quantity of images to catalogue and scan it will take many years to complete the existing collections. With continued interest and public support, I very much hope the image bank will find its place among the existing heritage providers in the city. This page was last updated on 29 May 2014.